Всего несколько месяцев прошло с момента релиза линейки продуктов Revit 2014, и вот, буквально на днях, стал доступен первый Web Update. · Improves stability when using Trim/Extend tools with curtain walls. · Improves stability when selecting Top Rail Type from with Project Browser. · Improves stability when inserting Stairs. · Improves stability when using the Split Element tool on walls. · Improves elevation assigned to beams when the elevation of a related beam system is adjusted. · Improves graphics display of braces in course view when the justification parameter of the brace is adjusted. · Improves graphics display of braces in course view when using a rotated crop region. · Enables beams to be stretched using the Align tool. · Improves stability when upgrading previous version structural projects. · Restores Revit MEP 2013 circuiting behavior when connecting panels together. · Enables “Pick New Work Plane” ribbon tool for electrical equipment. · Improves performance when selecting a piping system which contains a large number of elements. · Improves stability when copying air terminals connected to duct segments. · Improves stability when sizing Duct or Pipe systems. · Improves stability when changing the type of Cable Tray or Conduit. · Improves stability when editing type parameters from within the System Browser. · Allows Stairs, Railings and Wall Sweeps to be individual entities when exporting to FBX format. · Improves data integrity of projects which contain RPC elements when exporting to FBX format. · Improves categorization of parts when exported to FBX format. · Improves performance when utilizing Render in Cloud functionality. · Improves appearance of material textures when Rendering in Cloud. · Improves graphics integrity of linked models when Rendering in Cloud. · Allows Point Clouds to be visible when unchecking “Show Imported Categories in this View” display option. · Maintains display order of filled regions which overlap solid hatches in projects that are upgraded to the Revit 2014 format. · Corrects visual fidelity of objects in printed output which show as “Thin Lines” in drawing canvas. · Improves consistency of displaying revisions within schedules. · Improves data consistency of keynote legend when un-checking ‘Filter by Sheet’. · Allows schedule footer text to follow column alignment. · Improves stability when pasting elements between two Generic Model adaptive families. 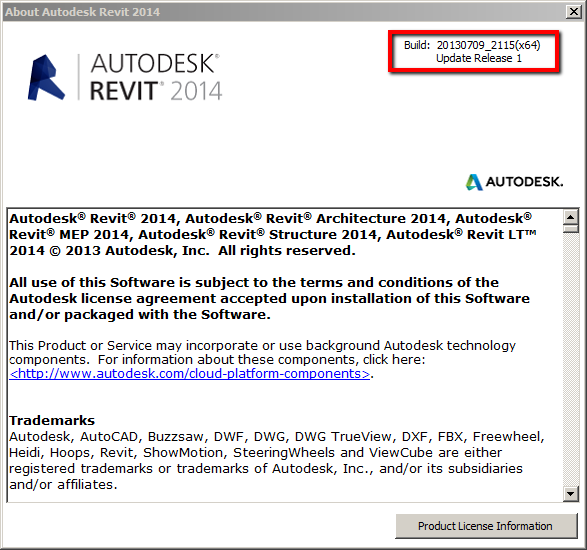 · Improves stability when exporting project to Navisworks 2014. · Improves stability during the loading of a family when utilizing either “Delete Element” or “Delete Type” option. · Improves stability when placing details. · Improves stability when a crop region is moved while the disjoin option is enabled. · Improves data integrity during “Save As”. · Improves stability when creating form elements. · Improves stability when exiting Revit. · Improves stability when printing Elevation and Detail views. · Improves stability while editing groups. · Improves stability when adjusting the elevation value of Levels. · Improves stability when navigating in a project which contains linked point clouds. · Improves stability when using the type selector within the properties palette. · Improves stability when editing the layout of a schedule. · Improves stability when adding a schedule to a sheet which has an active view. · Improves stability when upgrading previous release projects. · Improves stability when place a view on sheet. У меня не устанавливаются обновления на Ревит 13\14. Админы говорят, что это из-за установленных расширений. И нужно сносить все, ставить заново ревит , потом обновление, а уже потом расширения. Это действительно так, или админам лень разбираться в проблеме? Евгений, админам всегда лень:) У меня все установилось без проблем. При попытке установить выдает ошибку №1625. Там что-то связанное с общим доступом и т.п. Ладно, когда выйдет более существенное обновление, заставлю их, раз они так говорят, переустанавливать все.